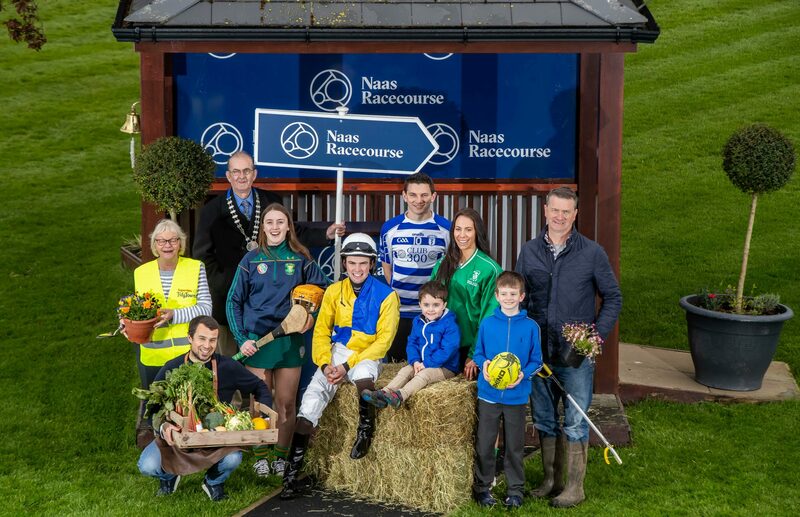 We our delighted to announce our new initative NAAS TOWN GOES RACING that encourages the whole community of Naas and the surrounding areas to embrace their local track and Go Racing! We pride ourselves on being a community track, located just minutes away from Poplar Square and we want to ensure that our town feels part of our track! The Naas Town Goes Racing campaign will include various activities over the next few months which incorporate the local community including an art competition for schools and a tidy towns competition for both residents and business owners. We have a great day lined up for the community on Saturday 6th july, including Racing, Family Fun entertainment, Music, BBQ and local Traders displaying their products & services. We will also be announcing the lucky winner of the art competition and tidy towns competition. More details to be announced very soon. Pictured at the launch are (L-R) Laura Cahill, Kill GAA, Tom Ryan Manager of Naas Racecourse, Sonny O’Brien (age 4), Emily McKeon of Naas Rugby Club, Allan Shine CEO Kildare Chamber, Pat Clear President Naas Tidy Towns, jockey Tom Madden, Billy Hillis Mayor of Naas, Ronan Swan of Swan’s on the Green, footballer Eamon Callaghan and Bill Clear of Naas Tidy Towns.